1973 Triumph Stag - I recently read an article that called the Triumph Stag one of the Top 20 automotive failures of all time. That's good. Yes, the Stag had problems when it was introduced. Timing chains and water pumps were problems. The failure of either could cause catastrophic engine problems. The Lucas electrics were, like on all British cars that used them, a joke. The build quality, depending on the day, was just slightly better or just slightly worse than any 1970s US built car. But here's a little secret the makers of lists don't seem to know... The Stag is a quick, comfortable, well handling car. All of the problems mentioned above (and a few others) have been addressed by either Triumph, the aftermarket, or Stag owners themselves. The Stag is now no better or worse to own than any other 30+ year old car. So why is it good that list makers keep complaining about the Stag? It keeps the prices low. 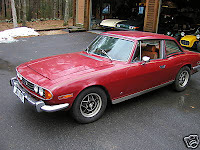 The driveable 1973 Triumph Stag being offered on eBay has a Buy It Now price of $5500.00. Nice 4 cylinder MGBs often sell for that kind of money now. A Stag is twice the car with twice the engine. Name another V8 powered British roadster that can be had for that kind of money. Buy a Stag now before someone makes a list of Top 20 automotive bargains and includes the Stag. Prices will then go up. Click here to see the eBay listing for this Stag. Click here to see an earlier Triumph Stag post. 1965 Sunbeam Tiger - In an earlier post I mentioned that I once owned a Sunbeam Alpine. At car shows I used to see really nice Tigers selling for less than 10K. I wish I had bought one back then. Those days / prices are long gone. This Sunbeam Tiger is an extraordinary 28,000 mile car that has been in the same family since new. It's not a show car, but could be made into one without too much effort. Me? 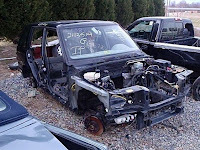 If I bought it I'd just fix the few things that need to be repaired and drive the hell out of it. 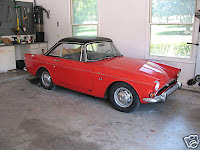 Click here to see the eBay listing for this 1965 Sunbeam Tiger. 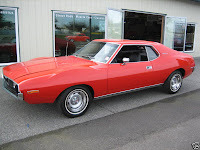 1973 AMC Javelin - Another car I'd like to own. What can I say? I like Javelins. I always have. This one would be perfect for me. It's restored, but not over restored. It's clean, but not so clean that I'd be afraid to drive it. If I had a bigger driveway and checking account balance, this car would be mine. Click here to see the eBay listing for this 1973 AMC Javelin. 1999 You've Got To Be Kidding Me - This thing has a "clean title". It was a 1999 Range Rover. I bought a Peugeot 505STX once with just a missing back bumper and it had a salvage title. This doesn't?! ?